Chickpeas, sesame paste, garlic, and olive oil…mix em’ all together and voila! The perfect over-hyped middle eastern appetizer is born: Welcome to the world hummus! With a recipe so simple, why is it that some hummus simply tastes better than others? That’s where the public hype fails to fill you in on the juicy details. There is a certain method required in achieving impeccable consistency and delicious taste, and that’s where we come in. Our healthy dip is made from fresh ingredients daily. We never use canned chick peas, instead we boil our chick peas, mash them just enough, blend in the Tahini, toss in garlic cloves, and mix mix mix. As our luscious hummus begins to form into a smooth paste, we slowly start adding the lemon juices and mix a little slower to allow it to distribute evenly. Finally, we let it chill in the fridge so the ingredients have time to fully be absorbed by the hummus creating an irresistibly balanced flavor when served. Not only do you get to indulge in this mouthwatering dip, but you get to improve your health while you do it! 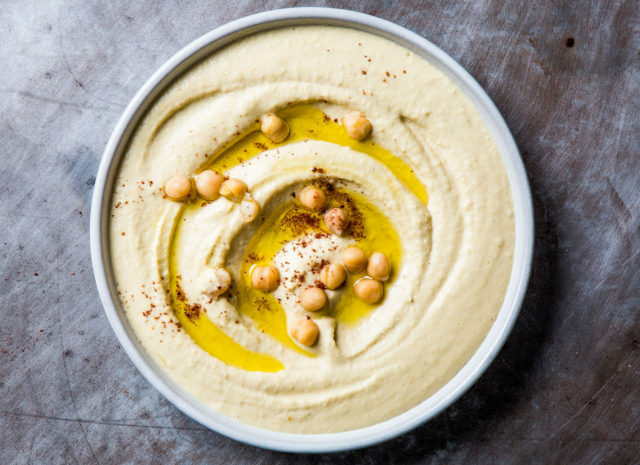 Hummus is packed with super food ingredients like chick peas which are pure protein, garlic which has anti-inflammation properties, and Tahini which is packed with calcium. This tasty dip comes in first place when compared to other dips like queso which is calorie dense but contains very little nutrients. Most canned and supermarket hummus brands contain xanthan gum (ew) to elongate shelf live and preserve consistency. You won’t see that with Me Jana’s hummus! We create our hummus daily to ensure you reap all the health benefits this tasty dip has to offer. I don’t know about you, but after writing this I’m ready to go take a dip…with a piece of hot pita bread…in some hummus…drizzled with olive oil. Join me at Me Jana! The Mediterranean diet is the second healthiest diet in the world following the Japanese!